So now LPCC’s are licensed – where can they work? In California, an LPCC can practice privately if – and only if, they are licensed here in California. So far the only people who meet this requirement are those who already had another license (LMFT or LCSW) here in California and who took the Gap exam to qualify for the LPCC license also. People who were licensed as a Professional Counselor in other states and moved here are beginning to qualify to take exams and become California licensed LPCC’s. 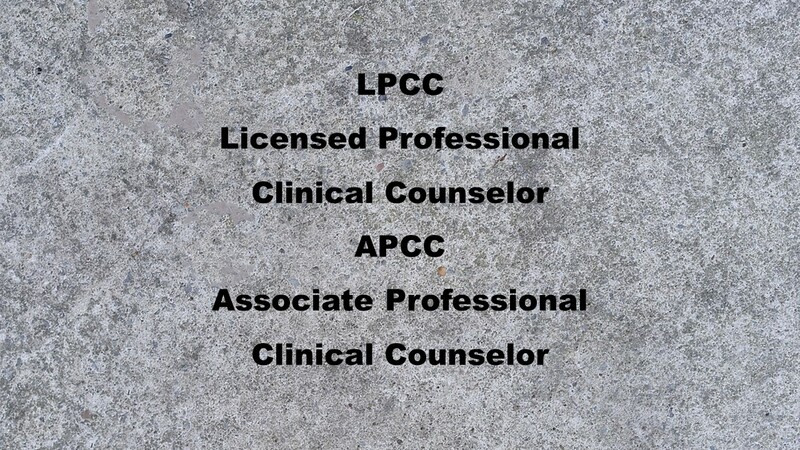 LPCC’s have a special role in working in career counseling, mediation and a few other areas that are somewhat different from other mental health professions. LPCC’s should not treat children, families or couples unless they have had additional training in those areas similar to the training LMFT’s receive. Interns of any license (MFT interns, ASW and PCC interns) are not allowed to have their own practice and must work under another licensed person. In a for-profit practice, the intern can only work for a limited period (6 years) while gathering supervised hours and testing. Interns and associates who work in governmental settings or other “exempt” settings may be able to work longer than the 6 year period their first intern number is good for. Because of quality concerns, I expect most employers to limit the time interns who work for them have to get licensed and still work seeing clients. Some people are attempting to get around this licensing requirement by calling themselves Life Coaches, a profession that to the best of my knowledge is currently not licensed or regulated. If the client’s issue relates to anything that may be caused by a mental, emotional or behavioral disorder then the client should be seen by a licensed mental health professional. Coaches should restrict their practice to clients who do not have a mental illness but want help in accomplishing more in life. The more promotional material I read and view online from coaches the more nervous I am that they may be stepping outside their scope of competency as well as their scope of practice. The laws may vary in other jurisdictions but the legal and ethical principles to stay within your scope of practice and scope of competency should be the same everywhere. This entry was posted in Law Ethics & Practice and tagged By David Joel Miller MS Licensed Therapist & Licensed Counselor., co-occurring disorders, coaching, David Joel Miller LMFT LPCC, happy life, Licensed Professional Clinical Counselo by David Joel Miller. Bookmark the permalink. I’ve been an LMFT for over a dozen years. I kept hearing about being able to be “grandfathered” in for the LPCC, but every time I called CAMFT, they had no info for me, and kept saying “soon”… When I called again last summer, I was told it was too late!!! Hi Maureen, let me tell you what I can about this. Not that it will be much help. The facts in this situation seem to be a moving target. When the law creating LPCC’s passed it was up to BBS to implement regulations including what LMFT’s and LCSW’s would need to do to be grandfathered in. You had to apply by December 31, 2011 to be eligible to take the GAP exam and become grandfathered. So many people applied during 2011 and especially on 12/31/2011 that it took a long time for BBS to review the applications. The GAP exam was not ready till much later. This is probably why CAMFT kept telling you they did not know. We were not sure for a while if there would be a GAP exam or what it would cover. All we knew back in 2011 was you needed to apply by December 31, 2011 or you could not use the grandfather path. Recently BBS stopped giving the exam and there are still people who applied before December 31, 2011 who are waiting to take the exam. Why they pulled the exam I do not know. If you did not apply in 2011 then you need to do another path. If your degree meets the requirement for being an LPCC, which probably means a program at a CACREP accredited school as in rehab major, you might be able to do the hours of internship and take the exams. But that route is like starting over as an intern. I expect the LPCC exams will be a lot like the MFT exams are now only there will be a different subject matter emphasis. If your degree did not qualify you to be a PCC intern you would need a new degree. People moving in from other states can do make-up work but not those who received their degree here in California. That is my understanding of this. For more info you might need to talk with an attorney or with BBS. Sorry to tell you all this. It is probably not what you wanted to hear. Evening David! About 16 years ago I went out with a guy that seeing a life coach! OMG!